Actress Rani Mukerji has been one of the most versatile actresses in Bollywood. Her transition from mainstream commercial roles to challenging women-centric characters has been phenomenal. Even when it comes to comeback films of actresses, Rani bounced back strong with Mardaani (2014). 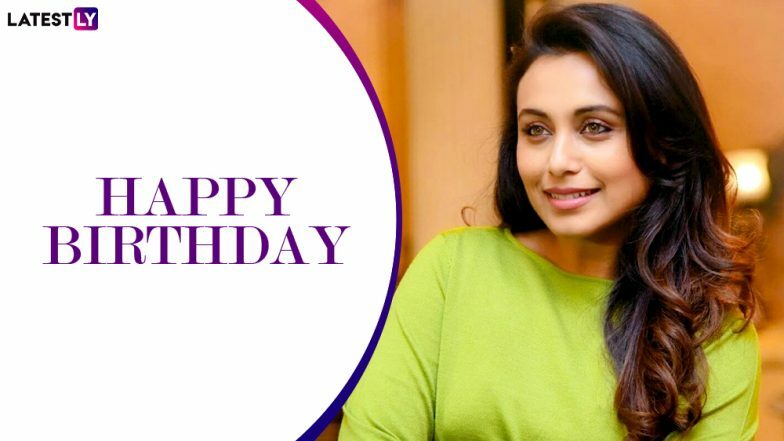 As the actress turns 41 today, we celebrate her birthday by looking at some of her best on-screen characters and how Rani managed to shine in those roles. We are sure several big names such as Hichki, Black are coming to your mind already. Let's take a look at some of Rani Mukerji's pathbreaking roles till now. Interestingly, most of Rani's films have had her play a strong female character be it the crazy con artist in Bunty Aur Babli or even the matured character in Hum Tum. Mardaani 2: Rani Mukerji as the Feisty Cop Shivani Shivaji Roy is Back. One of the biggest films of Rani Mukerji's career that brought her acting talents to the fore was Sanjay Leela Bhansali's Black. Starring her in the role of Michelle McNally, a blind, deaf, and mute person. The emotional story and Rani's superlative performance won over the hearts of the audience. The film also starred Amitabh Bachchan in the role of her teacher and it was a delight to see Rani holding her own and putting up a brilliant performance even next to the megastar. No One Killed Jessica was a film re-telling the real-life story of the Jessica Lal murder case from 1999. The film starred two great actresses, Rani Mukerji and Vidya Balan in starkly opposite but thoroughly impressive roles. Rani essayed the role of Meera Gaity, a feisty journalist who can smell a story from a mile. The actress managed to stun us with her performance as the persistent and hard-working journalist. The Mani Ratnam film had as many as six main characters and the multi-starrer had some big names such as Ajay Devgn, Abhishek Bachchan, Rani Mukerji, Esha Deol, Vivek Oberoi. Despite having a supporting role, Rani impressed with her act as Shashi. She played the role of Abhishek Bachchan's wife's character who is dealing with an abusive husband. Her character was inspirational given that she chooses to break away from the love of her life after deciding to not put up with his abusive behavior. Saathiya was a remake of Alaipayuthey and once again another Mani Ratnam directorial that Rani managed to shine in. The film's highlight was the amazing chemistry between Rani and Vivek Oberoi but apart from that, it was great to see the actress play the role of a middle-class girl who's hardworking and tries to balance her Medical studies along with her passionate romance. In the 2005 film, Bunty Aur Babli, Rani Mukerji and Abhishek Bachchan managed to pull off great characters of two con artists who manage to become India's most wanted couple after duping people across different cities in India. It was a delight to see Rani pull off such a loud character. Babli is all about show-off and Rani managed to channel in the whole small town vibe extremely well. Rani Mukerji: I Will Continue To Challenge Gender Stereotypes. It is not easy to make a film about someone suffering from the Tourettes syndrome considering how low the awareness of this genetic disorder is in India. But, we are glad Rani took this challenge and played the character of a teacher who suffers from Tourettes. The film was managed to send out a great message and it was nice to see Rani take up the unconventional character. Well, of course not just these films, we also loved Rani in Kabhi Alvida Naa Kehna, Hum Tum and Talaash. After her last successful film, Hichki, we can't wait to see what the actress is going to do next. We definitely hope Rani keeps giving us some amazing strong-female characters ahead too.